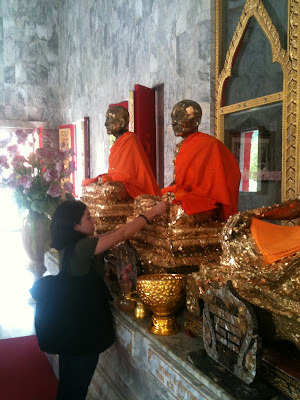 Calista Leah Liew: Half Day City Tour of Phuket! Half Day City Tour of Phuket! Rubber tapping is the process by which the sap (rubber) is collected from a rubber tree. An incision is made in the tree's bark, which cuts through the planting cycle to optimise the latex yield. When the cup is full, the rubber tapper will collect all the latex and take it back to a small "factory", usually right next to the plantation. Then, it is poured into moulds and formic acid is added to coagulate the liquid latex. This transforms the liquid latex into a firm solid block of rubber, which is initially rolled using a wooden roller so that it is thin enough for it to be rolled by the mangle machine. This machine is then used to texture the rubber. Next on our itinerary, was a visit to Three Beaches View Point, the best view in Phuket! You can see the beautiful bays of Kata Noi, Kata and Karon here, and let me tell you, the view really is spectacular! =D Sorry for the lamp post.. Lol..
As you can also see, it was windy too! Haha.. I have so many photos with my hair all in my face.. =.="
From there on, it was one breathtaking view to another! We visited the Big Buddha on top of the Nakkerd Hills between Chalong and Kata, and even donated a THB300 to get a marble slab with our 祝福语 (words of blessing) on the base of the statue when it is complete! These are the steps. Yes, this is my expression every time I see a long staircase. A photo of the bells that were hanging along the top of the staircase. Just because. =) The view is really pretty from the top of the hill, but my (crappy) camera couldnt capture it very well as it was getting ready to rain.. =/ This is the 2nd Buddha that's on top of the hill. It's 12 metres high, made of 22 tons of brass and cost 8 million baht to complete. According to www.phuket.com, about 10 years ago a group of friends were walking through the forest in the Nakkerd Hills when they stumbled upon a place with stunning vistas of both sides of the island – Chalong Bay lay in one direction while on the other they looked down over Kata and the Andaman Sea. It would, they thought, make a perfect place for a viewpoint – something that could become as well known as Phuket’s favourite sunset viewpoint, at Laem Phromthep. Funding for this massive project is coming entirely from donations, and is expected to cost about 30 million baht to complete. The Phra Puttamingmongkol Akenakkiri Buddha – to give it its official name – will be 45 meters high and 25 meters across at the base. The smaller Buddha image, will be devoted to HM Queen Sirikit, while the big one will be devoted to HM King Bhumibol to celebrate his 80th birthday. Interesting huh? The Thais are very respectful to their King, and you can see his face on banners and posters almost everywhere in Phuket! Next up, we made a stop at the famous Wat Chalong, a Buddhist temple not far from Big Buddha. Our guide explained that a temple is not famous because of its beauty or whatnot, but it is famous because of the monks who stayed there. The 2 monks who made this Wat famous are Luang Pho Chaem (1827-1908) and Luang Pho Chuang (1875-1945). There are gold statues of them, plus another (Luang Pho Gluam) in the prayer hall, and many Thais stick gold leaves to these images to pay respect to them and ask for their blessings. I also did the whole shake-the-tube-til-a-stick-falls-out.. Haha.. For the life of me I cant remember what it's called!! Argh!! Freaky thing is, nothing was happening for the longest time, until I thought to myself "Please just let me know what the next month will be like for me". Within seconds a stick with a number flew out! =O Apparently I'm only gonna have normal luck tho.. Nothing good nothing bad.. Haha.. Yes I know the girl next to me looks scary, and I apologize for the crappy photo. Ray is obviously not a photographer. Hahahaha..!! There were fire crackers going off in this stack outside the prayer hall. Apparently, this is to show gratitude for answered prayers. The Grand Pagoda dominating the temple contains a splinter of Lord Buddha's bone and is officially named Phramahathatchedi-Jomthaibarameepragat (is that a mouthful or what?!). The pagoda is decorated with wall paintings depicting the Buddha's life story and also features various Buddha images.Unfortunately, we didnt have time to go up to the top. I heard the view is also amazing! For some reason, we seemed to have a lot of time here, as we were the 1st ones back to the van.. And guess what Ray was doing? Mm-hmm..
We also saw the Century-old Sino-portuguese buildings on Thalang Road, which look like the ones in Singapore to me, and then to a honey factory which makes really good honey.. Thumbs up! I wanted to buy some honey chocolate as well, but Ray kept looking at my tummy when I said that so.. =( No fat Calista then? Sigh..
And that was the end of our tour! It was really fun, and we packed a lot into 5 hours, as you can see! I was gutted we couldnt go on the elephant safari though, but that tour was twice the price.. This tour only cost us about THB600 per person if I remember correctly..
Phramahathatchedi-Jomthaibarameepragat what a spelling feat, Pharmaceutical companies have shorter names for their wares! I just bought new tyres, good to know how it all starts! From getting the hottest involving plants, in order to picking out the audio, pictures in addition to managing the complexnesses on the event’s logistics – we’ll end up being right now there together with you, each phase on the way, so that many you’ll want to do, is actually state ‘I do’!